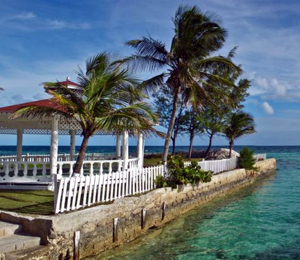 The Islands of the Bahamas typically sustain ideal vacation weather all year long. Since this string of islands is warmed by the Gulf Stream as is carries warm water from the equator, it enjoys pleasant temps even in the heart of winter. The Caribbean waters not only minimize large temperature variations, but also maintain pleasurable annual temps. The tepid waters of the Gulf Stream prevent evening temperatures from dropping below the middle sixties (Fahrenheit) during the wintertime. Like the air temps, water temperatures also stay in a comfortable range all year long. Consistent water temperatures are important for flourishing coral. Light and medium weight wetsuits should be used by divers from winter through early spring. Average water temperatures warm up to the eighties during the late spring and rise to the mid eighties during the summertime. While most of North America feels the frigid chill of winter, the weather in the Bahamas maintains perfect beach weather, with the air temperature highs in the upper seventies (Fahrenheit) during the coldest winter months. You’ll never experience a hint of freezing weather even at night (the average low temperature during the coldest month averages in the middle sixties). With water temps ranging from the high to low seventies (Fahrenheit), scuba divers can investigate the Bahamian reefs and wrecks in a full wetsuit that is at least five millimeters thick. Visibility is generally excellent during the winter when winds and seas are calm. For offshore anglers, Wahoo peaks during this time of year. It hardly ever rains during the wintertime, giving vacationers great sunbathing weather. Springtime brings warmer temperatures, with average high air temps ranging from the low to middle eighties (Fahrenheit). There are few spring showers in the Bahamas until late May, when sporadic thunderstorms may quickly blow through in the afternoon. The waters warm up, reaching the upper seventies, allowing divers to use shorty or light wetsuits in April. By June, scuba divers can use a Lycra skin or simply head out in their swim trunks. For fishermen, Mahi Mahi (also known as Dorado or Dolphin) peak during the spring, as well as Blue Marlin and White Marlin. For divers, visibility generally improves in the spring since the winds tend to subside. Although summer and early autumn are the rainiest months in the Bahamas, most of the rain falls in the form of sporadic afternoon thunderstorms (monthly rainfall usually averages around a paltry seven inches during these months). Even though air temperatures climb into the upper eighties (Fahrenheit), the sea breezes keep vacationers comfortable. Summertime water temps also rise from the low to the mid eighties -- ideal for participating in water-sports such as snorkeling, diving, and jet-skiing. No need to bother with a wetsuit while diving, although if you may want to bring along a skin just in case. Visibility remains very good during this time of year when a storm is not blowing through. Blue Marlin continue to run well through the summer. Blackfin and Yellowfin Tuna peak during the summer. Although the islands can be affected by the storms of the Atlantic hurricane season which lasts from the summer through October, most large storms bypass by the Bahamas to the south. Even though autumn is the height of the Atlantic tropical storm season, it is still a great time of year to vacation in the Bahamas with average high temps spanning from the upper to lower eighties (Fahrenheit). The waters temperatures remains in the eighties (Fahrenheit) into November. Visibility is still very good during this season when the occasional storm doesn’t blow through.